Hi Ladies! I hope you're all well and are looking forward to Easter this weekend. Today was my last day at work for a whole six days and I'm so excited to have some time off. I feel like I've not had any 'me' time for a long, long time so I'm very much looking forward to being a lady of leisure and chilling out. My mum and sister are coming to visit on Friday too, so I'm very much looking forward to spending some quality time with them. Anyway, before I go off on a tangent (I have a tendency to not know when to stop rambling), I'll get back to the focus of this post. As a beauty hoarder, makeup storage is a necessity and standard makeup bags just don't cut it anymore hence the need for 'makeup storage' - if you're not a beauty addict like me then yes, I realise this will sound insane. 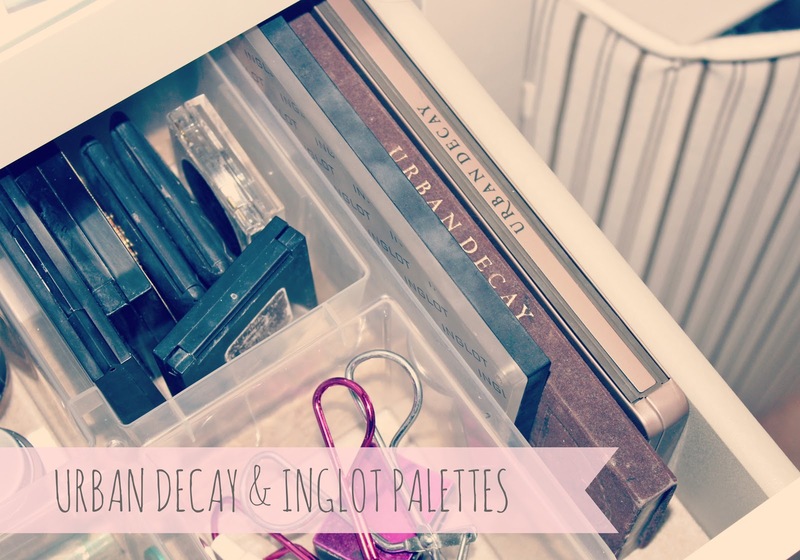 For such a long time I was really unhappy with my makeup set up and storage which I blogged about here in a really old post. It was messy, unorganised and squished into a teeny tiny black Argos dressing table and a set of Muji acrylic drawers. 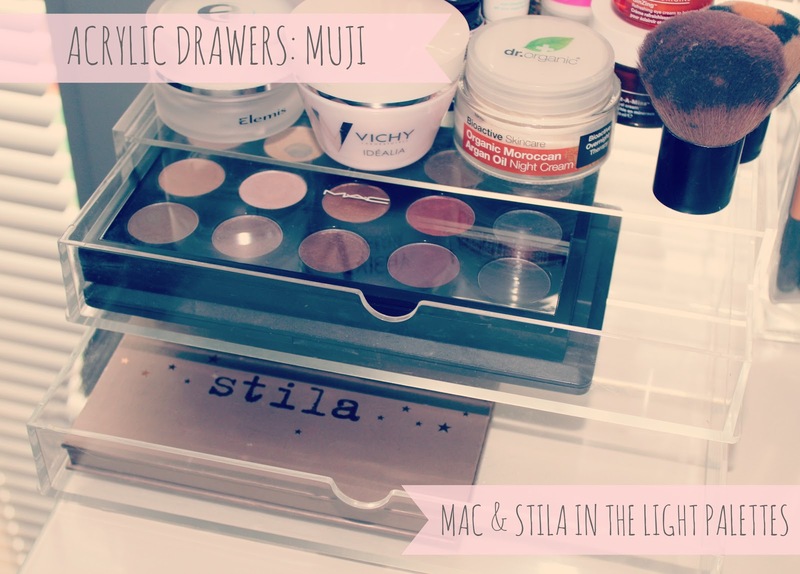 When I first got my Muji drawers I was really impressed with them but as my makeup collection grew and grew, everything was overflowing and before I knew it I was surrounded by a swarm of makeup and various other beauty products. With this being said, I knew I had to find a new form of storage. I tried my hand at wicker baskets and boxes but was never satisfied with how it looked. 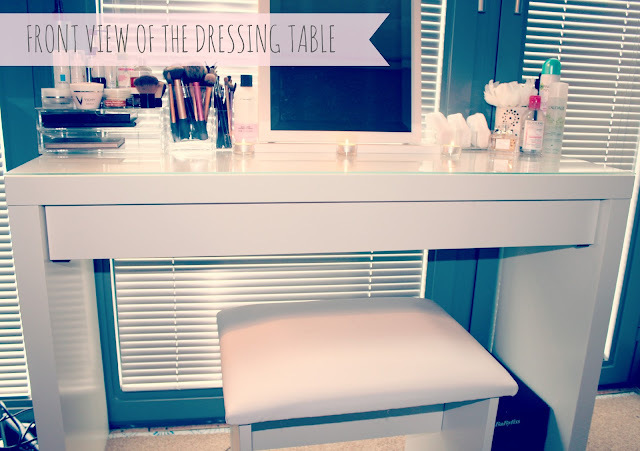 I'd always dreamed (yes, I really am that sad) of having a big white dressing table with a glass top after seeing similar ones on other blogs and Youtube channels. For me personally white dressing tables look very serene, clean and classy so I knew when I got around to buying a new one, I'd be replacing my small, dark and dingy black one with a pretty white one. After doing lots of research online to find my perfect dressing table, I decided on a high gloss white one with three large drawers down either side. I thought it was fabulous but the £300+ price tag was certainly off putting. However, I ordered it regardless and patiently awaited for it to arrive. Whilst waiting for the postman to deliver said dressing table, I found myself watching Estee's (Essie Button if you don't already know) Youtube video about her makeup collection (you can find that video here) and I fell head over heels in love with her dressing table. It was perfect and exactly what I'd been looking for. She said in the video it was the IKEA Malm dressing table so I quickly headed over to the IKEA website to have a search for it. Much to my surprise, it only cost £95 and I knew there and then that this was the one I wanted. Within minutes the £300+ dressing table had been cancelled and I was on my way to IKEA to hunt down the MALM. If you hadn't already guessed from the bazillions of photos above, I managed to hunt it down and I couldn't be happier with it. Its a fairly large dressing table (almost twice the size of my previous one) and it has a large pull out drawer and a glass surface. I think it looks very sleek, neat and tidy and I couldn't wait to set about organising my makeup and making it look pretty. I decided I wanted to keep the surface of the dressing table looking relatively simple and uncluttered so I tried to keep things on the surface to a minimum. On the left hand side I've kept a couple of Muji drawers for palettes that won't fit into the big drawer, and all of my current skincare (and a couple of hair goodies) sit on top. I tend to switch my skincare up all the time so this is a good area for me to keep things I'm using regularly. 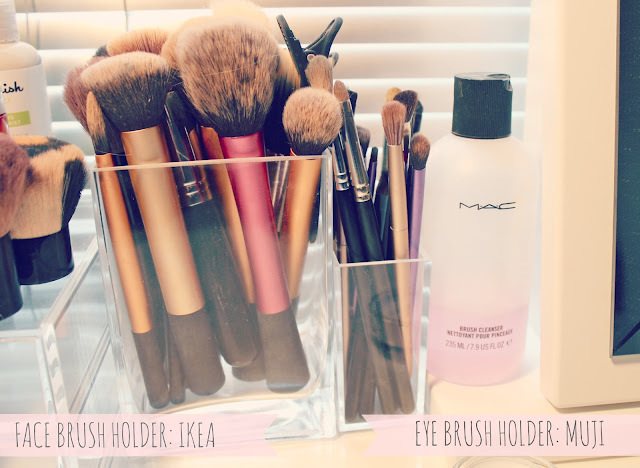 I then store all of my makeup brushes next to the Muji drawers and I've separated them into 'face' and 'eye' pots. The face pot is a glass vase from Ikea and the eye pot is a pen pot from Muji, both as cheap as chips. I then keep a mirror in the middle (a dressing table wouldn't be complete without one of those) and on the right hand side I keep another Muji pot, this time the Acrylic desk pot to store my cotton pads, a flower for some added girlyness and a few daily essentials like deodorant, Caudalie cleaning water and hairspray. I've also popped my favourite 'Miss Dior' perfume on there as the bottle is just beautiful and some cute little tea lights for decoration purposes (as you do!). Finally, I keep a large silver light next to the dressing table which is super bright and I use this when applying makeup at night time. Moving on the large drawer, I decided this would be the perfect place to store all of my makeup. I also picked up the IKEA Malm drawers (£75) when I was mooching around Ikea to store all of my jewellery and other beauty goodies (hair care, skin care, nail polishes and all those other lovely beauty bits) which you can see in the corner of my first photo but I'll save that for another post or I'll be here all day. 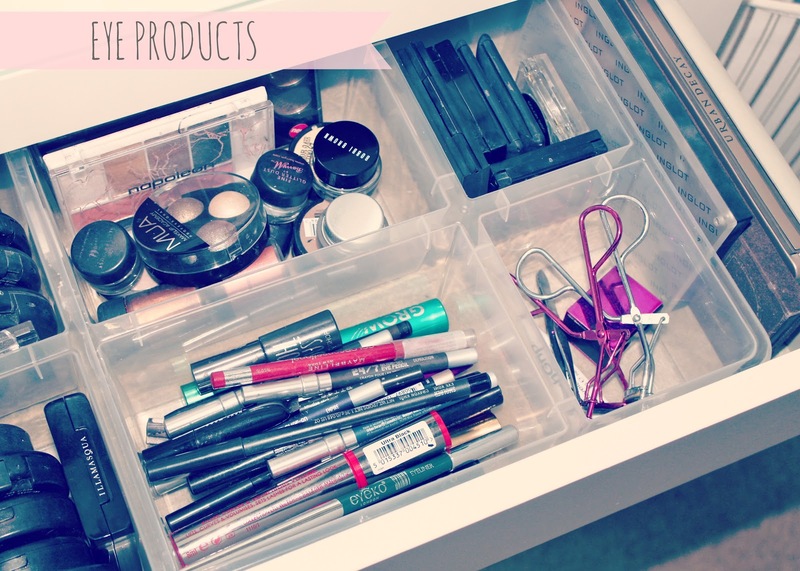 When it came to organising my makeup into the drawer, I wanted to buy some partitions I could pop inside to keep my makeup in organised sections. Gosh, I sound like some sort of crazy makeup mad woman! Ikea came up trumps again for this and I bought myself three of their Antonius basket inserts which are essentially just plastic boxes with 5 different sized compartments. They only cost £1.70 a piece which is a total bargain and a very cheap method of storing makeup. Unfortunately, I couldn't manage to fit all three of the inserts into the drawer so my boyfriend and I had to chop a piece off one of them so they would all fit. This means I technically have 2 and 3/4 inserts in the drawer, incase you're wondering why the 'eye' products insert is missing a section. 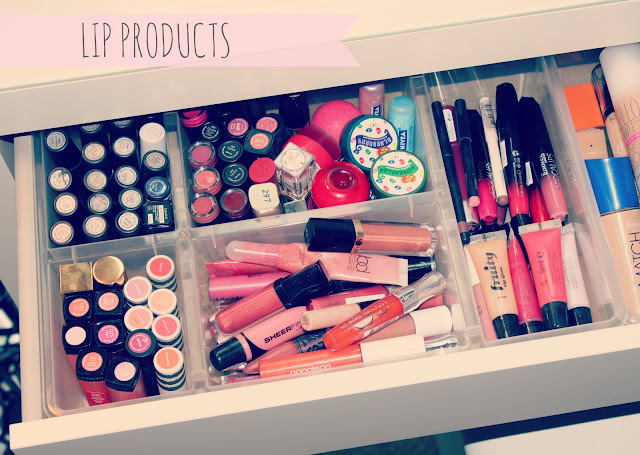 Okay so this is probably the section I was most excited to organise as lip products are my ultimate makeup weakness. If you can't already tell from the madness above, I love them and can't stop spending my money on them. As MAC lipsticks are my favourite, I decided a section would have to be dedicated to them and as you can see, they all fit in there perfectly (with the exception of one random Illamasqua one, oops!). I've put them in upside down too so I can see the name of each which has been really handy. I've then put my YSL, Topshop and Revlon lip butters together (more favourites of mine) and other miscellaneous lipsticks have all been bunged together in another section with lip balms. I then have two sections for lipglosses, my Rimmel Apocalips and a few lip pencils. This is definitely my favourite section and looking at it gives me a huge sense of satisfaction. Don't judge me! The next section of my drawer contains everything 'face' related so this is everything from foundation to blush. I also keep primer, concealer, powder, bronzer and highlighters in this drawer. Considering I'm not much of a blush person and tend to stick to the same set of face products at all times, I was quite shocked by how full this section is. I guess thats what you get for being a beauty blogger. I also didn't realise I had quite so many MAC face products until I started clearing products out from my Muji drawers. They do look very pretty all lined up next to each other though. Again, this gives me a weird sense of satisfaction (what a creep!). If you haven't already guessed, this section contains all things eyes. To be honest, I tend to stick with my eyeshadow palettes so I don't have an insanely big collection of eye shadows. I have a couple of eyeshadow duos from NARS, some Maybelline colour tattoos, Barry M, MAC and NYX pigments, a couple of cheap palettes, my MAC quad and various other eye kits including my beloved Benefit Brow Zings. I then have a whole section dedicated to eyeliners and mascaras which is a bit ridiculous to be honest, who needs this many? I think this section will be getting a clear out soon. Finally I've popped all of my 'beauty tools' including eyelash curlers, false lash glue, a sharpener and tweezers in their own little compartment. At the very end of the drawer there was a little gap so I thought this was the perfect place to store a few of my eyeshadow palettes including the Urban Decay NAKED 1 and 2 palettes and my Inglot palette which I'm yet to finish filling. I could only fit these three in the drawer so I've popped my MAC palette and Stila in the Light palette in the Muji drawers on top of my dressing table. I thought it would be handy to keep a couple of Muji drawers up there for any 'overflow' I end up with from this drawer. Yes I know, as if I don't have enough makeup already 8). Finally I thought I'd include a photo of the makeup bags I often use for keeping my 'every day' makeup inside or for travelling. They were both really cheap from Primark and I absolutely love them, just look at the cute designs. I tend to use the 'beauty' one for travelling and the floral Cath Kidston esque one for keeping my everyday makeup in. I don't always use it for every day makeup but if I'm being lazy and know I'll be using the same products all week, I tend to pop them all in there. It saves me an extra five minutes before work in the morning which means an extra five minutes in my cosy bed. OH YEAH!! So there we have it guys, my new dressing table and makeup storage. I'm really pleased with how it looks and I couldn't wait to share it with you all as I personally love being nosy and having a snoop at how other people store their makeup. I've only had it all set up for the past few days but its already made getting ready much easier. I love the fact I can now open one big drawer and clearly see where everything is in organised sections. If you're ever in IKEA or are after a new dressing table, I can't recommend the MALM enough. It really is my dream dressing table and for £95 its a total bargain too! I hope you've enjoyed having a sneak peek at my set-up and collection and if you'd like to see how I organise my jewellery and other beauty products into the tall MALM drawers, just let me know! 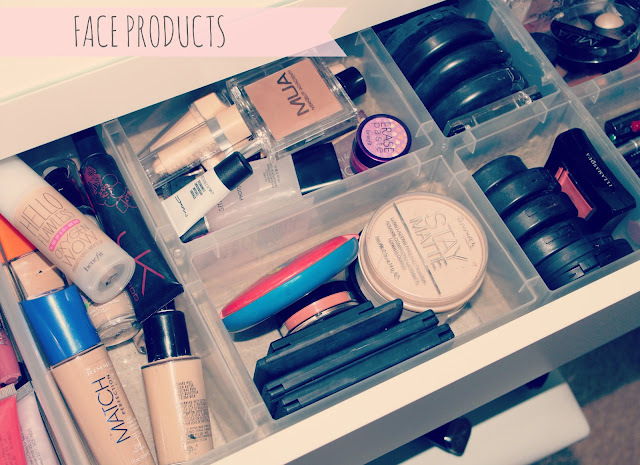 How do you organise your makeup? Do you like what I've done with mine? Oh my god I love your make up table and the drawers inside to put your make up are a genius idea! Oh my goodness! I have died and gone to make up heaven! I can fit all my makeup into a teeny bag...definatly missing out on something here! Jelous a lot. I am so jealous! It looks so pretty and organised :)! 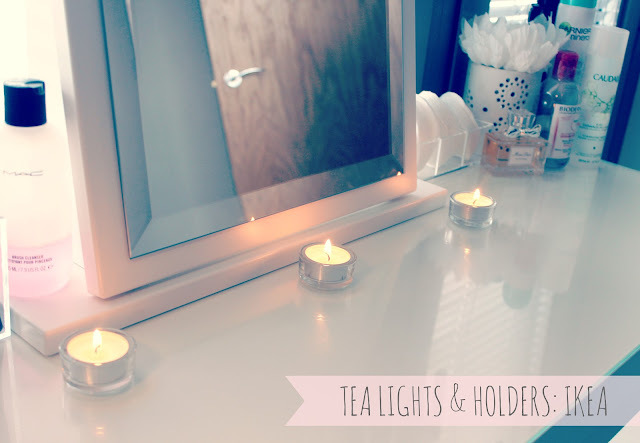 I wish I had the room for a dressing table :(! OMG your storage is amazing!! Majorly jealous! So cute and classy too! This dressing table is incredible! do the drawer like dividers come with? Cos if so, i need to buy this as its just what i'm looking for! I like IKEA Malm drawers too. They are really versatile. Our IKEA stuff always last for years. As a fellow beauty blogger, I understand your "hoarding" habit. Just need to adopt your sense of neatness. Jealous of your hoard :) Fab dressing table! Oh my god, it's so pretty! I really need a dressing table, definitely going to have to go and check this one out. Muji have amazing storage solutions too... sorry credit card! I've wanted a dressing table like that forever and yours is gorgeous. I think I'll definitely be having a look into it as it is quite reasonably priced as well. So jealous of your lip and eye product collections! woooow, you got a lot of stuff. this looks so good, will be taking some ideas! Ah wow, this has made me want to organise my stuff! I love the dressing table. This setup is the best I've seen yet!! This is awesome, you're a really lucky girl! Looks fab Kayleigh! 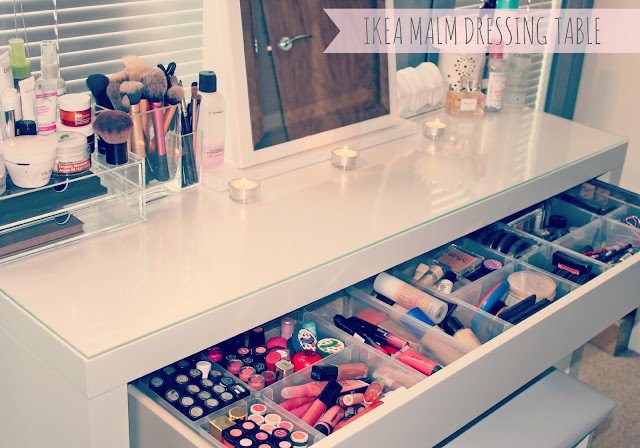 I'm such a huge Malm fan (I have the oak range) I neeeeed the dressing table after seeing this! My sister has exactly the same furniture. Such a good idea. So organised, you have some wonderful make up. It looks perfect! Your so organised!! I use an ikea dressing table too, along with Fuji storage but I also have wicked baskets for the odds and ends. Need to change those though as its a cluttered mess & I often forget what I've got in there! Really enjoyed reading this - I'm such a nosey moo so these types of posts are my favourite! Literally just checked it out on the website to find it's a bit too big for my room, gutted! Love love love your organisation. Your makeup storage is just perfect. I'm green with envy my drawers don't look like this! GORGEOUS!!! Everything is so organized and elegant! SUCH a pretty collection, so organised! I love that dressing table! You got such a good bargain with those organiser inserts as well, they look fab and are so practical! I'm jealous! I love the table and how you have everything organized. I am always looking at how other girls makeup setup and always wanting to re-organize mine. Great post. I plan to do the same. But first, I need to clean the area. love your set up! i like the light that you use, do you find it works good for photographing beauty products as well? That is such a good way to set everything up! I LOVE this post! I have one of those fancy glass old fashioned dressing tables that i love but it has no room what so ever to store anything! Seriously need a trip to ikea to get some of this stuff! That's awesome! I would love a dressing table of this size! Wow, so amazing! I'd love a table like this to keep everything tidy. Great post! I love that dressing table can't believe it was from Ikea! I can only dream of having enough make up to make a collection this big, it looks amazing and beautifully stored :). I have an Ikea dresser and I think I'll be purchasing those antonius basket inserts! I could not be more jealous! love this! Wow I love that desk! Such an interesting post, I honestly feel so inspired now. I will definitely be making a trip to IKEA, what an absolute bargain! My makeup is currently all stored in separate makeup bags on top of my dressing table and it looks so cluttered. I also love big white desks (my writing desk is also a white wooden one). Fantastic post, really interesting to read too- thanks for the inspiration! I SO absolutely LOVE the whole post and I must say I am jealous! Haha! But this is one commendable job that you have pulled! I am soooo in love with all of your make up and the storage! :) I am so jealous, i think i may have to change my dressing table and get this one! but of your whole make-up collection! Oh wow. I am so jealous of your makeup collection and storage. This looks so beautiful. I've just bought myself four of the muji acrylic drawers to store my makeup, can't wait for them to come so I can get organising! Seriously Wow..I"m a pretty organised girl and love all my beauty products well kept and preserved..So your post is truly inspiring. 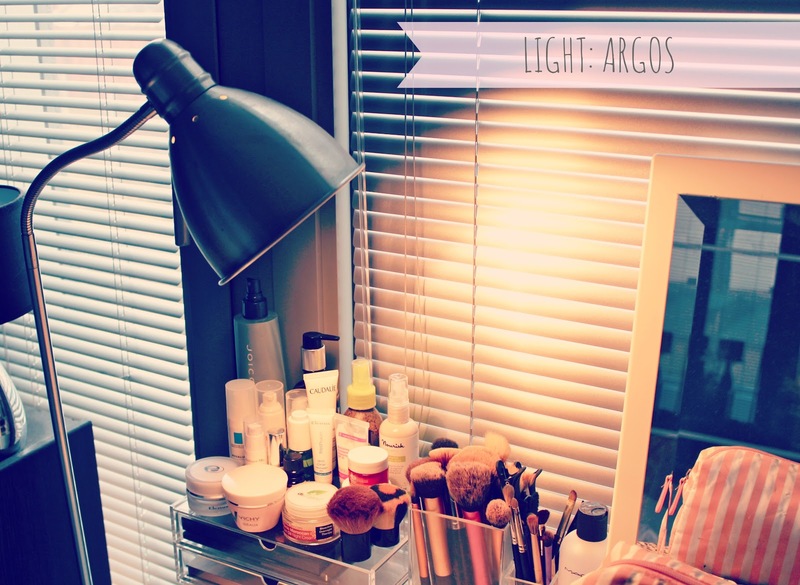 Your makeup collection is to die for and thinking of getting a similar makeup table from Ikea too..Can't wait! Your layout is amazing. love the set up! Your make-up collection is making my eyes water and my heart hurt, lol. Love your makeup storage! I also have this Malm dressing table, i love it! You have such a lovely blog! Love the pictures. I've wanted this dressing table for months now, I have all the other malm funiture this is just the missing piece of the jigsaw. Seeing it set out like this though is exactly the way I've wanted mine to be like, it looks so pretty and elegant. I'm now hurrendously impatient and want it more. Everything is so conveniently placed aswell. That dressing table is gorgeous! I NEED one just like that! So glad it is from Ikea and I can actually buy it in Australia :-) yay!!! Is your chair from Ikea as well? So organised! I just did a post on room makeovers. Please check it out! So, how many of the ANTONIUS basket inserts would be worth buying for the drawer? Love this layout you have, am really considering planning on going in the next few weeks to the Irish Ikea to purchase one! I have just ordered this vanity table! So excited! Love being organised! Is that stool from ikea as well? I've looked all over the site and i can't find it! It's driving me nuts!! obviously like your web-site but you need to take a look at the spelling on several of your posts. Many of them are rife with spelling problems and I to find it very troublesome to tell the reality then again I will certainly come again again. IKEA IS THE BEST PLACE IN THE WORLD. That may be a little dramatic but I love that place. I could always use more inspiration when it comes to storing my makeup! Unfortunately I do not have enough space for a cute table & all that storage :( Your setup is gorgeous though! So sleek! Where did you get the chair from? Where did you get your bench and mirrow from? Some facilities offer boxes, locks, and packaging supplies for sale to assist tenants in packing and safekeeping their goods, and may also offer truck rentals (or may allow free use of a truck for a new tenant). LOVE YOUR BLOG! And your make up collection and storage is BEAUTIFUL! Your collection is huge! But very well organised! Like you, I joined the craze and bought the exact same Malm table! The only thing is though that the drawer doesn't seem to come out all the way which is really frustrating because I obviously bought it with the intention for it to store lots of my makeup in a similar way to how you have. I'm just wondering if you had any problems with the drawer because from the pictures it looks like your drawer is fully functioning (yes, I'm jealous!) and if you had any problems then how did you fix it? 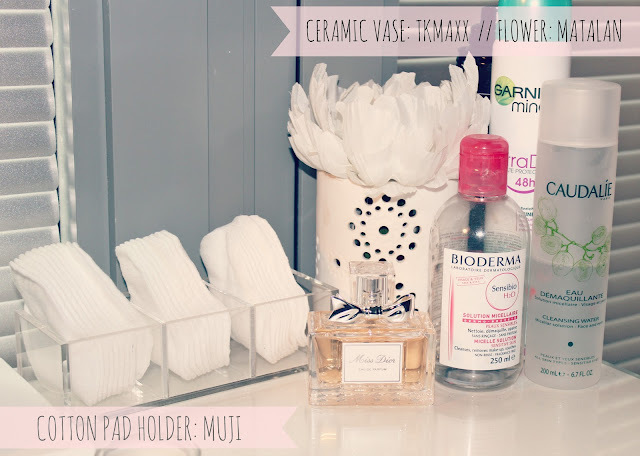 I've also gone a little crazy on the Muji website before and have similar containers to you! I was recently on the Homebase website and came across this great little acrylic drawer set. I bought one and it's great for storing lipstick in! It fits two lipsticks lying flat lid to lid and as I'm loving the addition to my table, I'm recommending it to you cause I think it would look great on yours! this blog is amazing! gave me some amazing ideas. This has given me so many ideas for my room that I'm in the middle of designing! Thank you! How did you set up your mirror and where is it from !!! Also where did you get that lovely white stool! It is amazing! Thanks for inspiring me - I hope you don't mind me mentioning you on my own blog?! love your storage for makeup, super organized and looks great! Wow!! Looks amazing!!! i love love love the way you set up your vanity! i have a question did you get your mirror at ikea too? 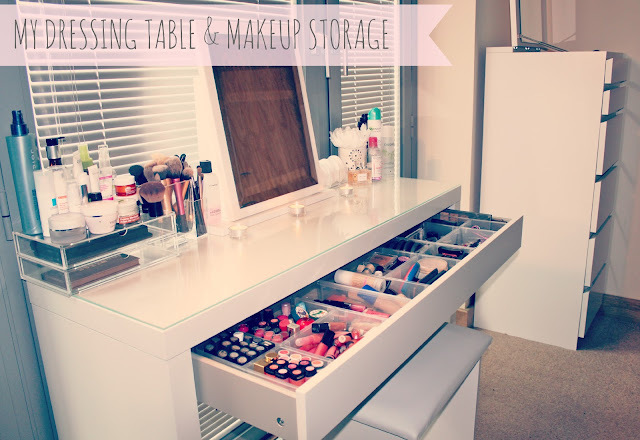 if you dont mind me asking..
Love your make-up storage and collection! It's just big enough to give you room to have chose between products. You are the main reason why I now own a Malm dressing table hahaha - I had been stalking your blog for a couple of months now taking inspiration from your set up and it didn't matter how many times I visited this post I didn't care its addictive lol. I have just started my love affair with makeup because of my younger sister so I will be an even more frequent visitor now that I'm following you...avid reader. Thanks for this, I came across your blog looking for a stand for a new mirror for my old crappy dressing table. I saw your dressing table and just had to have it. As I was reading I was thinking £300..,mmm sod it, then bingo it was only £95 from ikea. Picked it up today. Now looking for the compartments. Thanks so much, great informative post. Where did you get the plastic drawer organiser!?? hi, your blog content contains good information and this is actually help to know people. thanks for sharing.. we are providing Moving Companies in Kwazulu Natal,South Africa. I bought this for my daughter when i did her secret room makeover, it is a perfect size even in her small room! Hey I love what you've done with your storage! I super jealous of your collection! I'm a young, aspiring blogger and would LOVE it if you would check out my blog. It's called emeroo on blogspot. http://emeroos.blogspot.ca/. Thanks, and your awesome! So lush! I have an issue with space in my room. 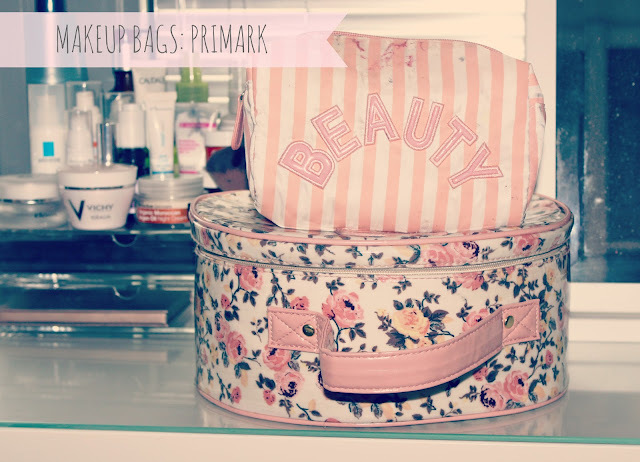 I would be all over this if i had to room, major make-up envy! Beauty Express is a health and wellness company offering the best skin care services to our clients. At Beauty Express, we believe that your skin is an all-important asset that will last you a life time. This is why we offer only the highest quality products and services. Our team of highly qualified and experienced skin care specialists are dedicated to providing you with the top notch service that we are so renowned for. I love your dressing table, sadly I'm still at the wicker basket stage for mine. They are rather full and four of them but theres no room for a dressing table yet. Hope one day I will have enough space to add a dressing table. I have the desk from the collection and I love it, but I still want the dressing table, but I cannot get rid of my elliptical... Sacrifices, sacrifices. Love your collection in any case and the way you organised it. 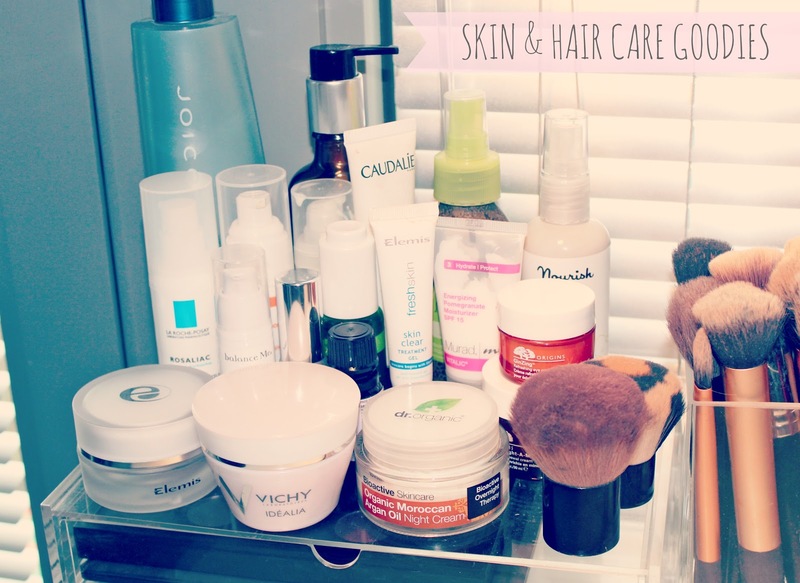 My beauty products are all over the place as until recently I was not a huge fan of beauty products. I love the bench! Is that also from ikea? I just love it. I will be getting one of those tables too. Can I get the bench there too? please come check out my blog. I am a new blogger and would appreciate it very much! !